You can now easily donate online to help struggling families pay for their students' meals. 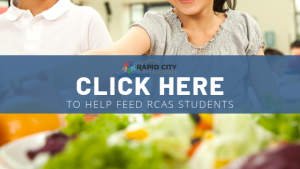 If you are interested in donating, please choose "Click Here to Help Feed RCAS Students" below. Thank you for your contribution! Applications are available online via Family Access (preferred) or you may download the Free and Reduced Meals Application. These can be returned to the Rapid City Area Schools Nutrition Services Office, 3302 West St. Cloud Street, Rapid City, SD 57702. Please check out this video to help you fill out your application! Our menus are also listed on our Nutrient Analysis platform, Health-E Pro. Please click the icon below, type in your school name, and select your menu. This platform also provides you with nutrition information for our meals.